JACKSONVILLE, Fla. - The Jacksonville Jumbo Shrimp, along with all Minor League Baseball teams, will honor America and help raise much-needed funds for a worthy cause this Independence Day holiday weekend by wearing specially-designed red, white and blue caps from New Era Cap Company for games played from July 1-4. All 160 Minor League Baseball teams will participate in the "Stars & Stripes" cap program and will wear the specialty caps as part of fundraising and awareness initiatives for Welcome Back Veterans, an organization dedicated to addressing the ongoing needs of military personnel and their families. 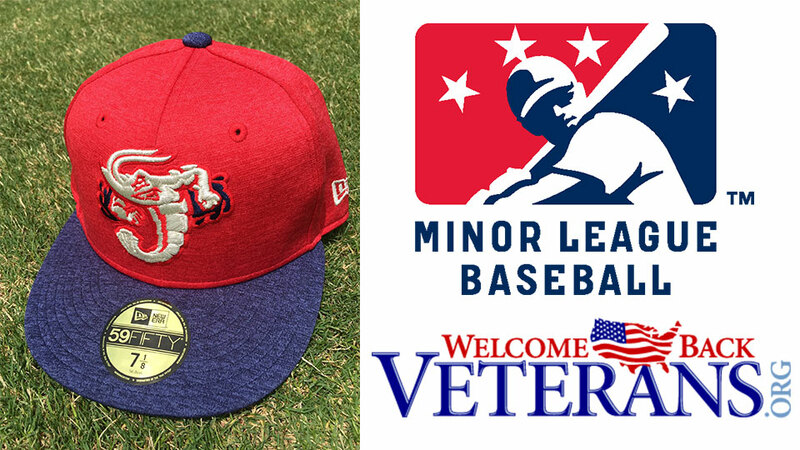 Minor League Baseball will once again donate 100 percent of the proceeds from cap sales to Welcome Back Veterans. Since the program's inception, MiLB has contributed annually to the veterans' organization. The cap features a red, white, blue and silver version of the team logo and may be purchased in team stores and online by visiting team websites. "We are honored to again team with Welcome Back Veterans and assist those who have served our country through the Stars & Stripes cap program this Fourth of July weekend," said Minor League Baseball President & CEO Pat O'Conner. "It is one small way we can show our appreciation for their contributions to our country and help honor America." UP NEXT: The Jumbo Shrimp return to the Baseball Grounds of Jacksonville Wednesday at 7:05 p.m. against Mobile. Gates open at 6 p.m. for the Date Night Special, when a package of two tickets, two hot dogs, two sodas and popcorn is just $20 at the box office windows. It is also Get JAX'ed Night, featuring local fitness centers and individuals competing in on-field and in-stadium contests.